I enjoyed the effort with this oil. There were at least three times when it was 'good enough' but it was not enough. Both times I was satisfied about the work and was ready to sign it but when I saw it in the studio the next day, it seemed to be lacking something. The sky changed a number of times as well as the light and color coming through the trees in the background. What made it all come together was when I hit the right side hard with the blues and greens. 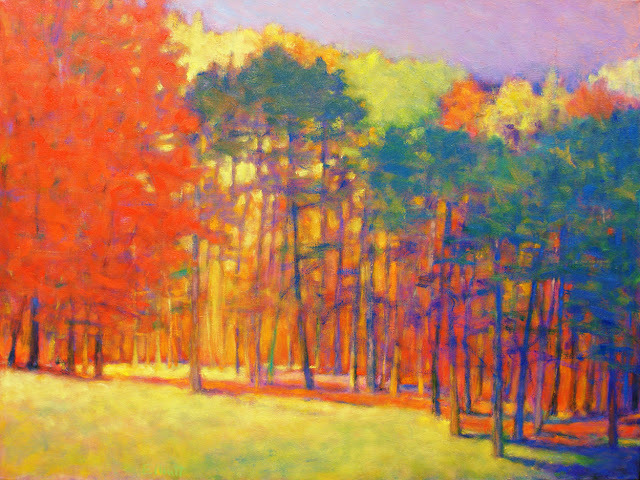 The earlier version of the oil was a fairly continuous line of orange and red trees. The dark blues added punch and counterpoint to the red trees on the left. Within a few days a wonderful couple, one is an artist, bought it. It's always a thrill for people to take your artworks home or into their offices, thank you!